Australian Property Finance Made Simple. A Step-By-Step Guide Explaining How To Build, Structure And Automate A Multi-Million Dollar Property Portfolio From Scratch… That Has The Potential To Create Financial Independence For You! If you’re someone who dreams about owning a large Residential Investment Property Portfolio, which will enable you to attain Financial Independence through property investing then this will very well be the most important letter that you’ll ever read! …that is easy to follow and makes so much sense. I promise you that by the end of reading this letter you’ll be wondering why nobody has told you about it before. 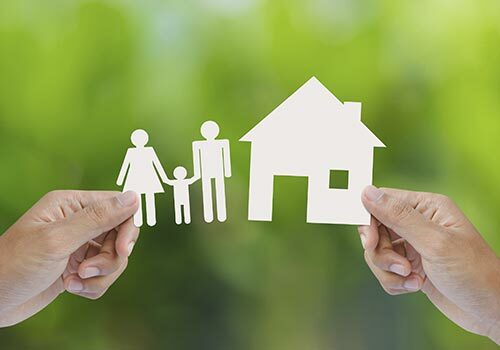 In-fact, you’ll be mad at everyone around you that has been putting doubts into your mind about the possibility of you owning a substantial residential property portfolio, – I know, like you, I have been there myself. If you’ve ever felt ‘overwhelmed’ or ‘stressed out’ with the seemingly insurmountable task of living your life…just getting by day-to-day without any hope of stopping work before you’re completely stuffed and old…with no energy or money left over to enjoy a happy, stress free, successful life; to travel, to faraway places, to give to your favourite charity whenever you like or simply have the time and financial freedom to do whatever you darn well like… then this book was written just for you! One thing that I must stress is that this is NOT a get-rich-quick scheme, and I guarantee that you will NOT become a millionaire overnight by following this system. I am not going to insult your intelligence or make unrealistic claims. 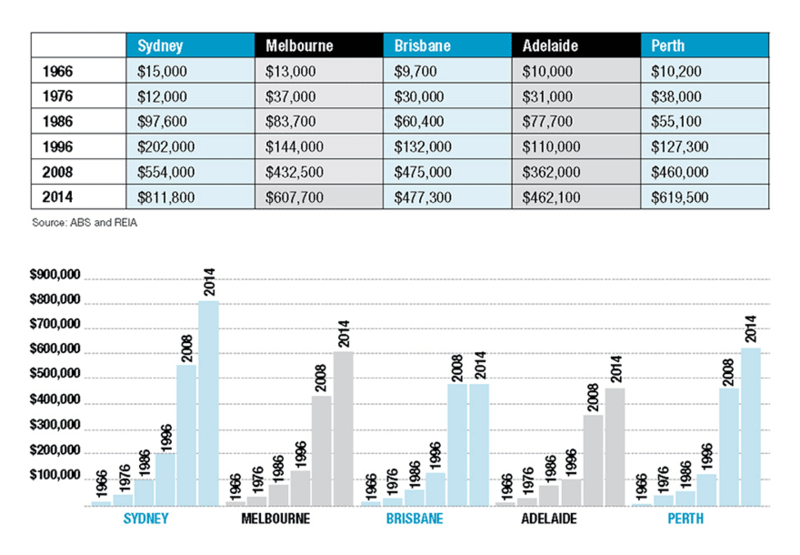 Did you know that despite the extraordinary performance of the Australian residential property market over the last 50 years, very few Australians have managed to grow substantial property portfolios. It seems crazy? Doesn’t it? Many sophisticated investors and experts believe the missing ingredient that separates the 1 per cent from the rest is financial literacy. If your answer is a resounding ‘Yes’, then order your copy of the book ‘Australian Property Finance Made Simple’ NOW! Plus SPECIAL BONUS when you order your copy today, a 10 Hour online video home study valued at $497.00! 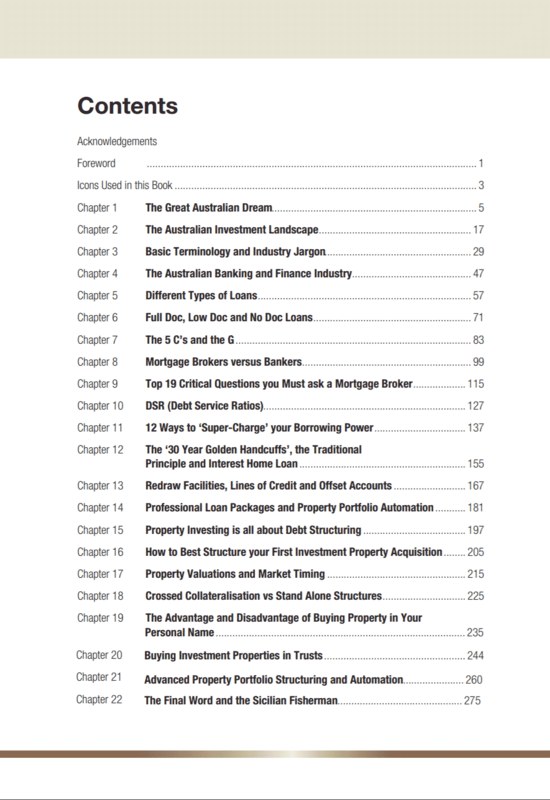 Download and Read 3 Chapters From the Book ‘Australian Property Finance Made Simple’ For Free! 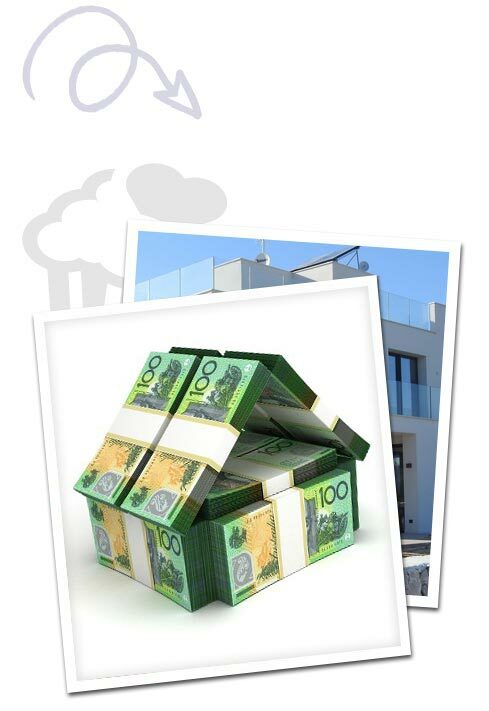 ‘Australian Property Finance Made Simple’. Chapter 11: 12 Ways to ‘Super-charge’ Your Borrowing Power. Chapter 16: How To Best Structure Your First Investment Property Acquisition. Chapter 19: The Advantages And Disadvantages Of Buying Your Next Investment Property In A Trust Or Your Own Personal Name…That Every Investors Needs To Know About! 3 Very Important Aspects Of This Book, Which Makes It An Essential Learning Tool For Anyone With A Home Loan, Or An Investment Property. This book was written under the assumption that the readers have ZERO prior knowledge of finance, loans or the lending industry. That’s why Chapters 3, 4, 5, 6, 7 , 8, and 9 are dedicated to give you a thorough understanding of the lending industry, the key players, as well as clarification of ‘industry jargon’… and believe me there is a lot of unnecessary ‘industry jargon’ used in finance and lending. Bottom line, I wrote the book for laymen – NOT industry insiders. This book is equally relevant for anyone with a current mortgage or anyone contemplating taking on a mortgage, irrespective of the purpose of that loan, i.e. owner occupied or investment purposes. The benefit of reading this book is that it will empower the reader with specific knowledge on loan structuring techniques that will enable them to pay off their mortgage faster than they thought possible! That’s what Chapters 10, 11, 12, 13, 14, 15, 16, 17, and 18 are all about. 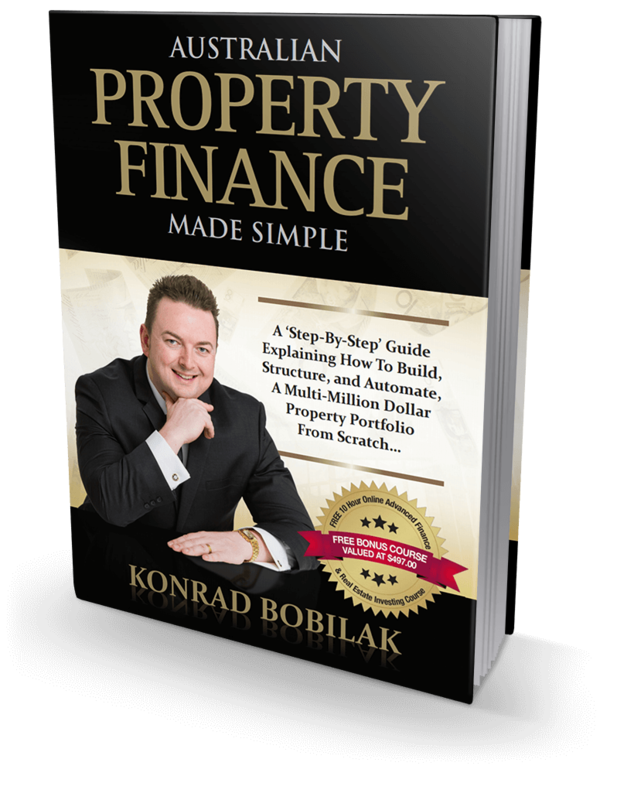 So whether you’re a first home buyer, first time investor, or a seasoned pro, you will be blown away with the contents that I have assembled in this book! Except…the recipe covered in this book is on how to build and structure a property portfolio that could eventually free you from work! It seems crazy? Doesn’t it? Many sophisticated investors and experts believe the missing ingredient that separates the 1 percent from the rest is financial literacy. The problem is that no one is really teaching the topic of financial literacy specifically when it comes to residential property investing. Certificate IV in Financial Services (Mortgage Broking) FNS40804. I became passionate (on the obsessive side) in real estate investing some 20 years ago, at the age of 18, and ever since I caught the property investing bug I have strategically worked in a variety of industries that allowed me to gain a real insider’s perspective on how successful property investors in Australia really made money from investing in property. Along the way I completed a Bachelor of Business Management (B.Bus.Mgt), at Monash University, specialising in Organizational Change, later undertaking further studies in Financial Planning, Mortgage Brokering eventually my ultimate passion, Real Estate. In addition, I have had extensive experience in Managed Funds, Risk Insurance, Real Estate Sales, Commercial Lending, Residential Lending, and Asset Finance, as well as being a Financier for one of the four major banks. In my varied roles, working predominantly with high net worth individuals, I have literally had a wealth of exposure to the unique mindset and financial structures of truly successful people and investors. Get to understand why certain people succeed in real estate investing and why others fail. To get to work personally with people who are successful property investors, and here I am talking about the 1 per cent of the very best in the country. My unique insights into ‘Wealth Psychology’ combined with a highly specialised knowledge of the Finance and the Real Estate Industry in Australia, made me a sought after Real Estate and Finance ‘Key Note’ speaker and successful real estate investor. Over the last 6 years I have had the privilege of having taught tens of thousands of people in Australia, New Zealand and Fiji, as well having the unique opportunity of sharing the stage with the likes of Sir Richard Branson, Tim Ferris, and Randi Zuckerberg in audiences of up to five thousand people. The number 1 reason of why you should listen to me, is that beyond all my credentials and real hands-on-industry experience… I have achieved considerable results as a property investor myself. Hence, the book ‘Australian Property Finance Made Simple’ has been written by a property investor for property investors. 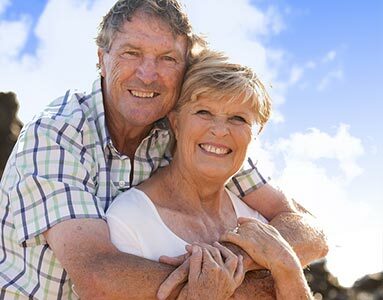 Whilst a small percentage of the Australian population has managed to increase their wealth thorough property investing, very few are actually maximizing their returns and fewer still have worked out how to best optimize their financial structures. Whether or not you are aware of this, this is costing you money, and more importantly the opportunity cost of time, and missing out on the potential of paying off your (non-tax deductible ‘bad debt’) home loan sooner, as well as missing out on accumulating more investment properties (tax deductable ‘good debt’) in your property portfolio. And that’s the reason why I wrote this book… this was my number 1 objective. 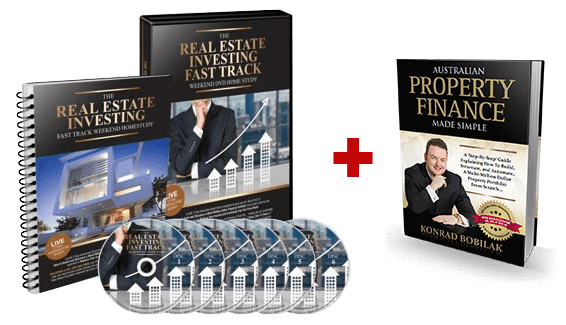 You see, whilst there is a plethora of information out there on how to find the best performing suburbs and properties, and about market timing, etc., very few companies and/or individuals are teaching the fundamentals behind how to best structure a large property portfolio, from purely a finance perspective. The ‘Australian Property Finance Made Simple’ book reveals the ‘secret recipe’ on how to correctly structure your finances with the objective of maximising leverage, tax efficiency, whilst focusing on buying more investment properties and simultaneously paying off your home loan in record time. This book provides the reader a real ‘insider guide’ into the lending world, outlining the key players in the mortgage and banking industry, and a detailed breakdown of the main lending products available on the market today. This book highlights in detail, the main loan structuring techniques currently used by the savviest and most successful home owners and property investors in Australia today, many of whom have paid off their homes completely in less than 10 years, whilst concurrently having built and structured multi-million dollar property portfolios. All anecdotal scenarios and recommendations that are made throughout this book are drawn from years of real experience working at a very high level in the banking and mortgage broking industries, as well as having personally applied the very same loan structures myself. 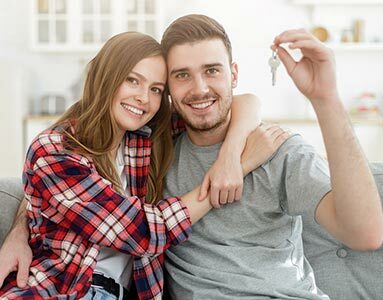 You are a first home buyer wanting to understand the very best loans that are available for you and how to best structure your finances in order to repay your home in record time, often in under 10 years. By reading this book, you will learn why it’s crucial to set up the correct loan structures before you buy your very first investment property, and how you can beat the banks at their own game in order to reduce the amount of interest that is being charged on your home loan. You are an aspiring property investor wanting to buy your very first investment property, and are unsure on how to best structure your loans. By reading this book, you will learn the best way to optimise your property portfolio structure from day one, revealing many little known loan structuring techniques that maximise your borrowing capacity, whilst maximising flexibility, future access to equity, as well as being tax effective and minimising risk. You are an established property investor and have secured between 1 and 5 investment properties, but have hit a financial ‘brick wall’ and are maxed out, or just unsure of how to go to the next level of sophistication. 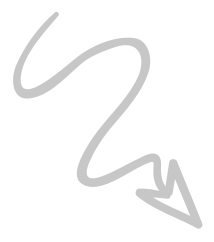 You are an established property investor and have realised that you have made some fundamental mistakes in the way that you’ve structured your property portfolio due to some ‘bad advice’. If something has held you back from aggressively acquiring more property, such as allowing lenders to ‘crossed collateralise’ your property portfolio, or you have an impaired credit file, have an irregular stream of income, or are simply using antiquated Principal and Interest Loans (P&I), you must read this. By reading the ‘Australian Property Finance Made Simple’ book, you will gain an insight into the industry’s best practices that have been applied by other successful property investors who have built and structured multi-million dollar property portfolios. 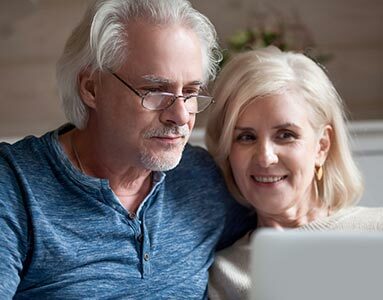 You will learn a ‘proven method’ of how to pay off your current 30 year Principal and Interest Mortgage in 10 years or less without making any additional payments, saving yourself tens of thousands of unnecessary interest repayments and years off your mortgage. You will learn how to best structure your first investment property acquisition, whereby you are maximising your tax deductions, and tapping into the power of leverage. 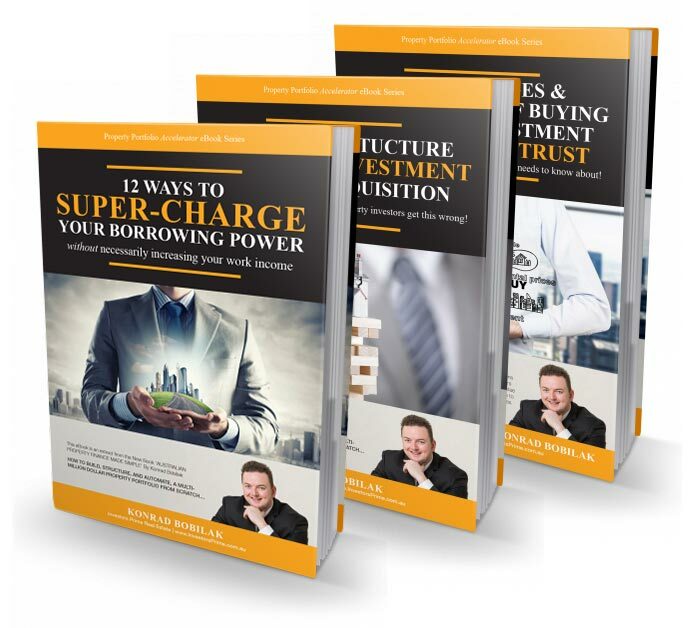 You will learn 15 Powerful Ways to ‘Super-Charge’ your borrowing capacity that will enable you to buy more property than you ever thought possible. You will learn the ’19 Crucial Questions’ to ask in order to choose the best Mortgage Broker in the industry. You will learn the ’12 Most Common And Deadly Property Finance Mistakes’ And How You Can Avoid Them’. You will learn how to get 1% plus discounts off your standard variable loan rate, save thousands of dollars in unnecessary interest payments and wipe off years of your loans…plus much, much more. Finally, the main reason I wrote this book is to equip the average Australian with enough financial intelligence to tackle what is perhaps the single biggest financial commitment of their life… their ‘mortgage’. This book is designed as a practical reference guide that will empower readers’ thoughts and illustrate why the ‘traditional’ home and investment loans are completely outdated and will take the average person decades to pay off, and how the banks have created this system that keeps them rich at the expense of the average Australian. More importantly, this book will give you a step-by-step blue-print on how to pay off your home sooner than you could have ever imagined, and how you can place yourself a financial position sooner, where you can start building wealth though acquiring a property portfolio! So, don’t wait a minute longer! Receive 3 FREE chapters from ‘Australian Property Finance Made Simple’. Simply, fill in the form for immediate access! 100% guaranteed privacy. We don’t spam. Ever! Get expert property investing tips and free resources straight to you inbox!